It is time to move on and when we are about to leave, we discover that Robby's battery is dead. I give him a jump start and all is okay. 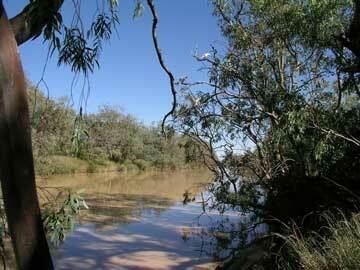 We leave the Cullyamurra Waterhole and travel via Innamincka and head north on the Cordello Downs Track. 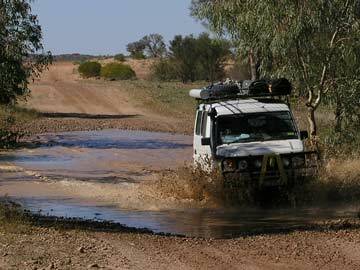 The road is very good for about 50 kilometres then drops to very poor. It appears that there are some oil fields in Queensland around here and that is why the road is good at first. After this the road has bits where only 40 kmh is possible but other spots where 90 kmh can be done. There are many washouts, with some long pools of water and side tracks around the worst bits. We stop for morning tea alongside a small dam with grass around it. From here the road remains the same but it gets a bit better after the turn off for the road to the east. Some time after this we pass Cordello Downs. This is a large property with a very large homestead. It has a very unusal stone shearing shed unlike anything we have seen before. This is said to be the largest shearing shed in Australia. You can see it all as it is right next to the road. We stop at Cadelga Outstation Homestead for lunch. This is an old abandoned homestead alongside a nice waterhole. There are heaps of corellas and but also lots of mozzies. Except for these, it would make a nice camping site. 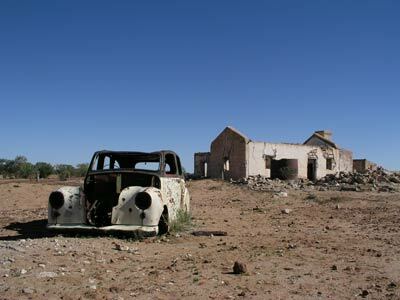 There is an old wrecked car here that is very photogenic and I have seen lots of photographs of it in books and web sites (and you will see one here too!). After lunch we are back on the road. We cross the border into Queensland and the road improves dramatically. A short time later we are on the Birdsville Development Road. As we travel, Les can hear us chatting on the radio. 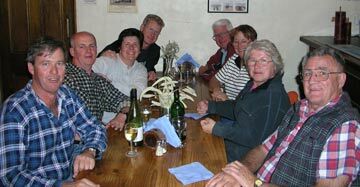 He calls us up and tells us he arrived in Birdsville the night before. We arrive in Birdsville about 4:45 pm local time (half an hour later than SA time). We set up our tent at the caravan park ($24 for two nights) and have a shower. It is great to have our first proper long shower in over a week. 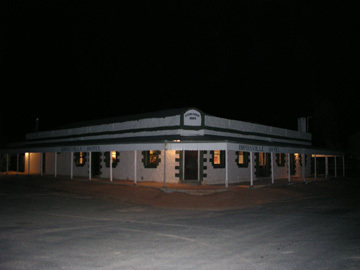 We go to the Birdsville Hotel for dinner, $15 to $20 a meal, not a great choice but nice. I have chicken Kiev and Frank and I share a bottle of wine at $18. Middies of beer (VB or XXXX) are $3. Today is a bit of a rest day and we are not doing much. We drive out to Big Red. 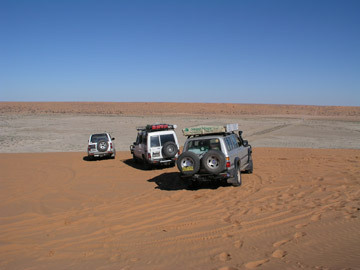 This is said to be the biggest sand dune in the Simpson Desert. We get to the spot where we think it is and easily make it up. So much for that we think! A little thought has me thinking that this was not really Big Red. I look north and see lots of cars up on the top of the dune. I wonder? We drive north and sure enough, this is Big Red. 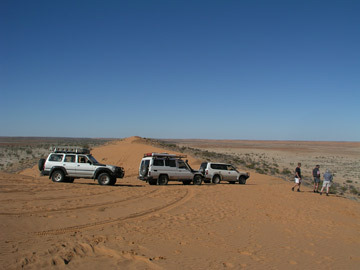 The main road does not cross the dune at Big Red, it crosses about 3 kilometres to the south of Big Red. Funny how none of the books or web sites I have consulted when we have been planning this trip has stated this. The road is obviously not new, so it means that for many years you have not had to cross Big Red when taking the top track across the desert. This is quite important to know as a lot of comment is made on the fact that if you are crossing from Birdsville to the west you have to climb over Big Red with a full load of fuel and water. Someone is telling a lot of lies to make money I reckon. Anyway, we have a go and I make it up second go. I would have got there first time but at the bottom of the dune there is a horrendous series of corrugations that cause me to drop my speed. Second time I take a different line and miss most of the bumps and keep my speed up. We return to town and refuel the car. Frank and I have lunch at the pub ($10 steak sandwich). 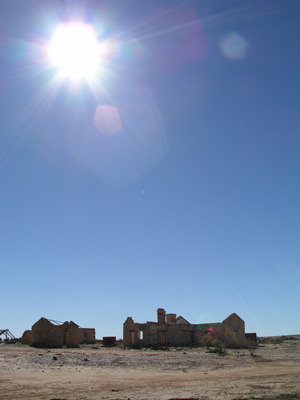 In the afternoon we go to the Birdsville Working Museum, $7. This is one of the best local museums I have ever seen. It is well worth spending an entire afternoon there, excellent.